Once we saw those adorable bookmarks in the latest issue of Country Living, the girl twin and I decided to get our crafting on and try these for ourselves. After a trip to Michaels to pick up some ribbon clamps and the fabric store for ribbon, we were raring to go. 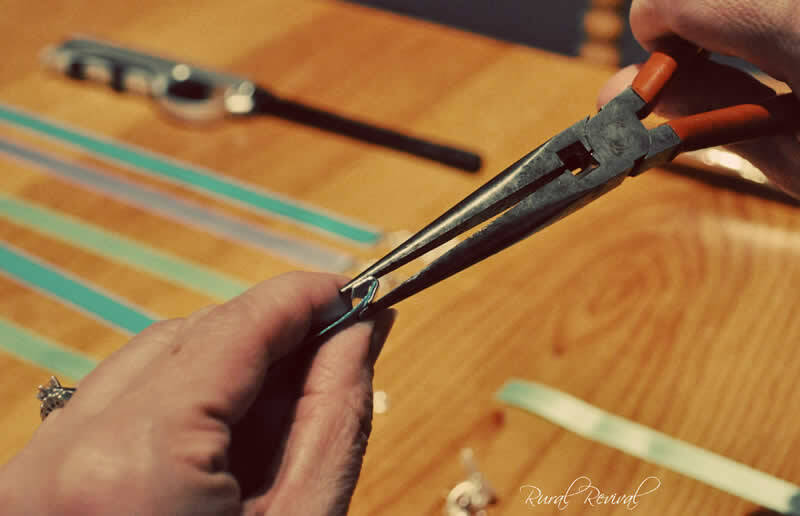 I'd never heard of ribbon clamps before; they were really difficult to close but after searching online, we discovered that flat needle nose pliers work best for closing the clamps. But don't let this photo fool you, they work best in the Artist's hands, not mine. Once the clamp is attached to the ribbon, you can add just about anything your heart desires with a small ring. We picked out different charms from the jewelery making section at Michaels, but I'll be keeping my eyes open for vintage brooches and charms when I'm thrifting, I think they would look darling paired with vintage ribbon. with an extra one left over (surprise Rural Revelers!). We'd like to share one with a Rural Reveler! Would you like one? If you're a follower, just leave a comment telling me you'd like to be entered in the giveaway. I'll draw the winner Sunday night. What a neat idea! You can use old funky jewelry you find at garage sales, singleton earrings, etc.! I would like to be considered in the draw for one of your lovely bookmarks. How clever you are! Please enter me in your drawing!! Thanks! 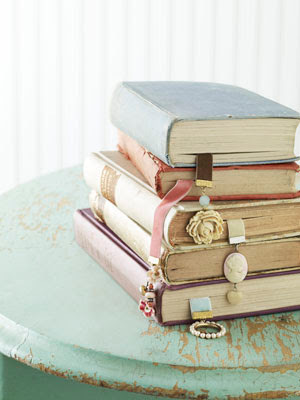 How cute are those bookmarkers! Of course I'd love to win something hand made by you and your daughter! Oh me me me!!! Beautifully done!! And Love I have plenty of books to use them in. Thanks for the chance Andrea!! Oh my goodness those turned out great! I wanted to try some of those too when I saw them. Good job! What a fun project to do together and a great gift idea. Oh yes, please count me in. I have a book or two or three that could use one of those beautiful bookmarks. Those would certainly dress up some of my books. I would love one! Lovely, Andrea. At first glance I thought they were from vintage brooches and jewellery. So pretty. 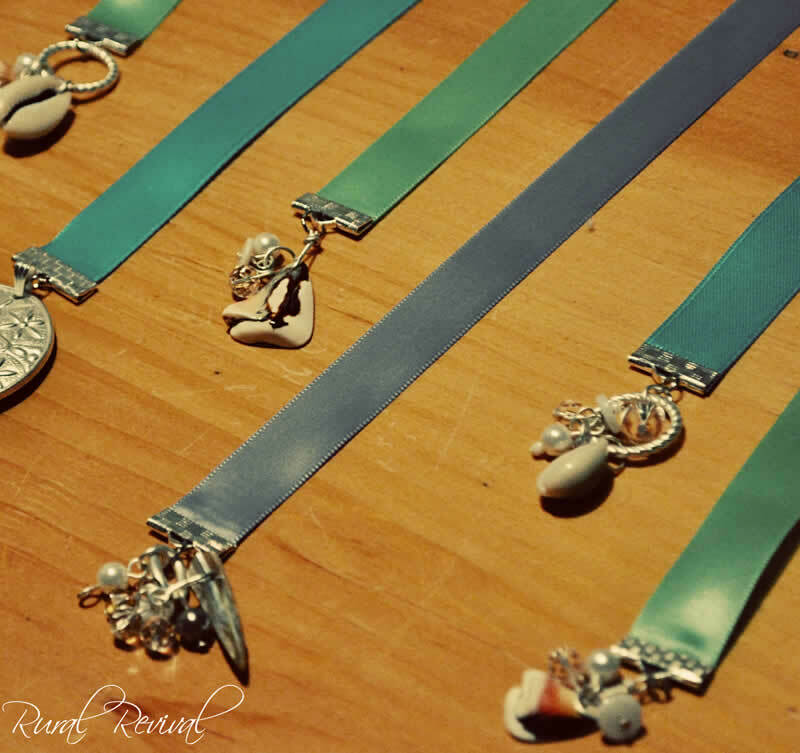 These bookmarks are simply gorgeous! What a clever idea! Please enter me in the giveaway. Your bookmarks are wonderful! I'd love to be entered in the giveaway. I think handcrafted gifts are the best. Terrific idea! Those would make fantastic end of year or beginning of year gifts for the teachers I work with. I'd love one for my book. You all know I am a book addict. Please drop my name in the hat. I had seen those clamps but never given them a thought. Of course now you know I'll have to go find some. Thanks for the beautiful ideas. I'm lovin' these!! Count me in too! I saw these too! Love them! I'll have to go out and get me some! Count me in!! You did such a nice job with those! They look fantastic! ...Btw your cat is super adorable! !